In recent years we had been RACING the weather to get our project watertight, enclosed and temporarily heated…FORTUNATELY that got done in NOVEMBER. The CARPENTERS are nearing completion of the interior mezzanine framing. STOREFRONT ENTRIES have been completed. PLUMBING waste/vent, water piping and gas piping are close to being finished. The ELECTRICAL contractor is also a couple of weeks away from pre-insulation/drywall rough inspections. Since most of the HVAC work is not encapsulated in walls or bath/utility room “roofs”, they have much less work in this phase and are on the job next week. ELECTRICAL: matt designed and the electricians installed the galvanized unistrut (no finishing required) "mechanical bridge" for the unit feeds to the circuit panels. the bridge is also used by the plumbers for the gas piping. Both the electrical and gas service mains enter the building at the same location. ELECTRICAL: both the circuit panel and communication feeds are adjacent in the utility room in each unit. ELECTRICAL: konstantine and victor are organizing the feeds from the service panels. ELECTRICAL: the service drop and main were reusable, the balance of the equipment needed to be new. ELECTRICAL: the mechanical bridge is filling up. the circuit panel feeds occupy the top of the bridge with the communication feeds on the bottom....organization. ELECTRICAL: eugene is terminating electrical and communication feeds in their respective pull boxes. ELECTRICAL: the circuit panel (occupies top pf bridge) pull box is on the left and the communications (occupies bottom of bridge) on the right. ELECTRICAL: wire is being pulled individual unit circuit panels. ELECTRICAL: service drop is being "tidied up". PAINTING: tomek is rolling water based masonry sealer. ELECTRICAL: electrical service is nearly done. 3/4" and 1/2" conduit is "waiting" to be piped within the units. STOREFRONT ENTRIES: nino and salvio did a great job installing the 3'-6" x 7'-0" entry doors and transoms. we always install oversized doors for EZ in/out. STOREFRONT ENTRIES: nino is fastening the threshold to the concrete floor. the red shims keep the threshold level when the anchor is tightened. STOREFRONT ENTRIES (looking SW): the exterior unit entry door installation is moving along. PLUMBING: all cast iron roof drain risers are being replaced and clean-outs added for easy maintenance. PLUMBING: ziggy is working on the PVC wast and vent piping for one of the units baths. PLUMBING: waste and vent DONE in this unit, on to the water supplies. PLUMBING: water supply being "sweated". PLUMBING: slava is installed gas pipe hangers for the unit feeds. each unit is separately metered. a supply pipe runs from the meter room to the unit's utility room. The furnace, water heater, range and dryer are gas fueled. PLUMBING: unit gas feeds (black pipe) share the mechanical bridge with electrical unit feeds and communications piping. PLUMBING: cutting/treading gas pipe.notice the gas pipe unit feeds on the rear wall. CARPENTRY: kris, tomek, and janusz...getting ready to start unit lofts, 5 thus on this project. CARPENTRY: drywall is installed to first for unit fire separation. clip angle is being hoisted into place to support long span TJI floor joists. CARPENTRY: clip angle is lag bolted to each stud. CARPENTRY: TJI floor joists are being layed out. MR. EVERYTHING: clemente has been working with us for 15 years and is INVALUABLE. he and his family do our demolition, site clean up, landscaping and finished project maintenance...the best. CARPENTRY: loft framing in progress. CARPENTRY: TJI install by janusz. CARPENTRY: TJI install in unit 5. CARPENTRY: kris and prznek laying out the 3/4" sturdifloor deck. CARPENTRY: loft deck installed, bathroom "roof" in process. CARPENTRY: bathroom roof installed. 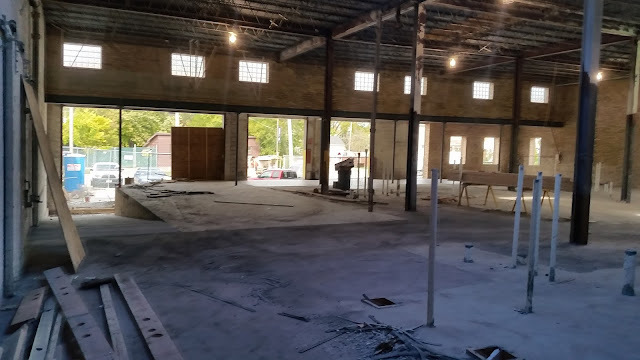 open area will receive translucent glass, but now it's scaffolding for the plumbers doing gas piping. HISTORY: somewhere we will use this "dickson weatherproof nail" fragment. they were the original owners/users of this building until about 2000.
konstantine lays out recessed lighting fixtures. loft framing unit 3 in process. andy describes skylight daylighting design. 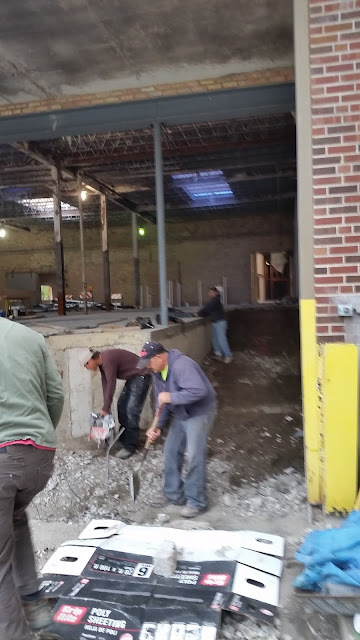 We have been BUSY…have had a crowded job site. CONCRETE, CARPENTRY, ROOF INSULATION/MEMBRANE, PLUMBING and HVAC contractors are efficiently on the jobsite at the same time. There will be an enclosed, watertight workspace in place in the next day or so. 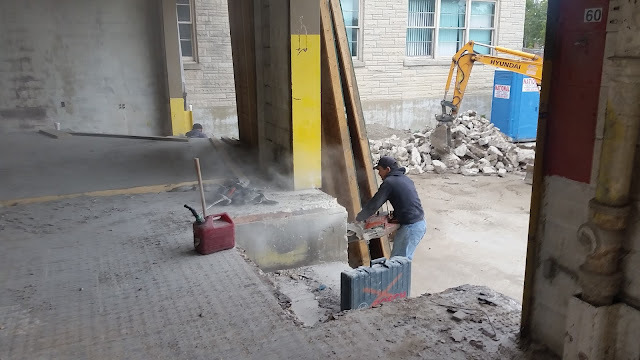 The CONCRETE contractor has completed the ADA compliant interior ramp as well as the concrete privacy wall that isolates dodge avenue from our transitional parking area. The CARPENTERS continue making good progress completing their pre-roofing insulation/membrane and skylight prep responsibilities. 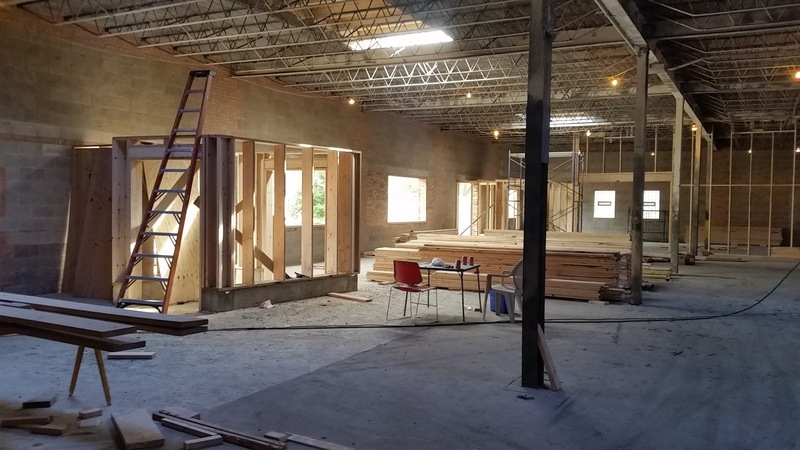 Interior framing and exterior opening infill continues with window installation nearing completion. 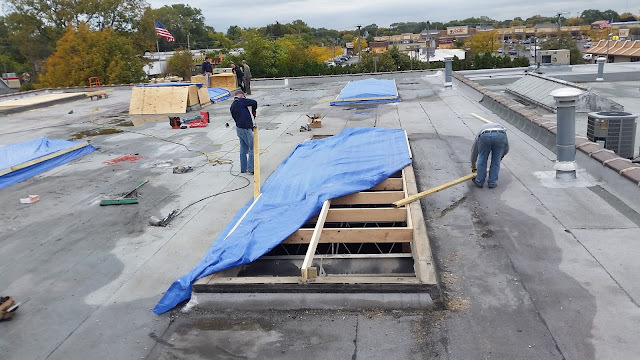 The ROOF INSULATION/MEMBRANE contractor immediately followed (the CARPENTERS) installing 4.5” polyiso rigid insulation (r28) over the existing modified bitumen roofing system. This was followed by a 60 mil TPO “white roof” membrane. During the “bidding phase” of the project we cut several test holes. Our investigation revealed that the previous roofing system had been “torn off” last time, thus we felt that re-roofing over that system would be a positive. The existing 5” perlite rigid insulation (r16) was also a positive and the existing membrane would expedite progress on the building interior. Most of the mechanical trades are “through the roof” with the remainder once they are on the job full force. It’s easier/faster for the ROOF INSULATION/MEMBRANE contractor not to have lots of penetrations to work around and to flash them later, thus we get a better final result. NEXT…CARPENTERS continue with interior mezzanine framing. PLUMBING begins with above ground waste, vent and water piping. The ELECTRICAL contractor gets into the exisitng electrical service modifications and service panel feeds. CONCRETE: miguel is prepping for slab infill at abandoned loading dock. CONCRETE: starting to grade for ADA compliant ramp. CONCRETE: ramp is complete, ready for exterior opening infill and interior framing. CARPENTRY: existing exterior skylights have been removed, that material will be re-cycled. renovation is NOT cost/energy effective. kris and peter prep each existing opening for a new 4' x 8' insulating skylight and infill the balance for new insulation/roof membrane. each of these units will have (3) 4' x 8' skylights. CARPENTRY: skylight opening modifications continue. everything is tarped to keep water infiltration to a minimum. raised skylight curb to follow. CARPENTRY: new skylight curb in progress by Przmek. CARPENTRY: curb has been framed and skylight installed. stud space will be insulated and drywalled later. 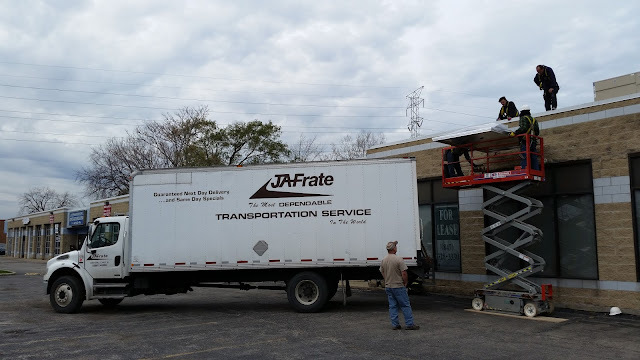 CARPENTRY: we use the lift as an elevator to get the skylights to the roof, then they are moved, gasketed and installed. CARPENTRY: bathroom and mechanical rooms are being "roofed". notice the the 10' breakthrough on the left. this allows for tenant expansion to additional units. ROOF INSULATION/MEMBRANE: materials are hoisted to the roof. ROOF INSULATION/MEMBRANE: lots of "STUFF". ROOF INSULATION/MEMBRANE: Analino and Ricardo on the job. 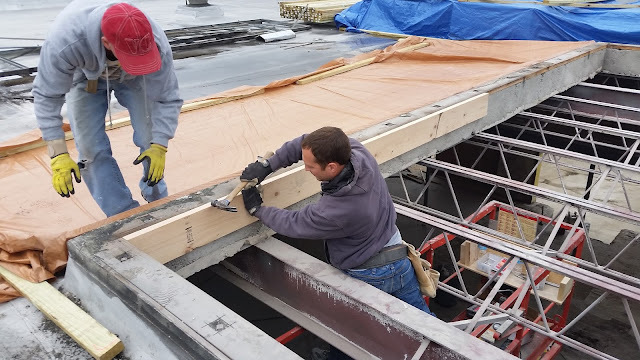 4.5" of polyiso rigid insulation is fastened to the existing roof deck. we only install what can be covered with the 60 mil TPO membrane that day. a special "contact" adhesive is rolled on to the polyiso and back of the membrane. it takes 10-15 minutes for the adhesive to cure, then the membrane is "flopped over" and rolled into place. repeat. ROOF INSULATION/MEMBRANE: membrane is being installed, hand rolling to follow. ROOF INSULATION/MEMBRANE: membrane is being installed. ROOF INSULATION/MEMBRANE: notice the roller in the center of the photo. most of the bubbles between the membrane/insulation are removed during rolling with the balance disappearing on their own in a few days. ROOF INSULATION/MEMBRANE: a new roll of 60 mil TPO + andy's shadow. ROOF INSULATION/MEMBRANE: it was more cost effective and "safer" to insulate/membrane the masonry parapet wall on the left than to tuckpoint the masonry leaving a non-waterproofed section. ROOF INSULATION/MEMBRANE: vertical TPO sheet counter-flashes the horizontal.Intersection is heat welded. ROOF INSULATION/MEMBRANE: DONE with this section. CONCRETE: due to it's height, the privacy wall was poured in two sections with the joint occurring below grade. CONCRETE: a section of brick was removed to achieve the necessary aesthetic facing Dodge avenue. CONCRETE: second section of wall is ready to be poured. the small piece of 45 degree angled wood (camfer) nailed into the form creates an edge that's less susceptible to breaking. CONCRETE: forms stripped, concrete is curing. it takes about a month to attain it's maximum strength. CARPENTRY: entry vestibules in progress, so are the unit demising walls. this section of the project has no second floor lofts...the existing ceiling height was too low. CARPENTRY: Tomek is working on the entry vestibule to units 6 & 7. CARPENTRY: units 4 & 5 interior framing are in process. this section of the project has enough volume for second level lofts. CARPENTRY: Kris and Matt are laying out the service corridor exterior entries. there is one 8' overhead door and a 3'-0" man door. CARPENTRY: Kris and Peter are framing the service corridor exterior openings. CARPENTRY: service corridor is taking shape. CARPENTRY: Przmek and Kris are installing windows in unit 2. CARPENTRY: the 22' adjustable ladders are great, we have 2. CARPENTRY: installing the 3/4" plywood deck at the mechanical room in unit 8. CARPENTRY: framing the mechanical room in unit 7. CARPENTRY: topping off the exterior entry off Dodge avenue at units 6 & 7. CARPENTRY: Tomek is working on the "breakthrough" between units 8 & 9. each unit has one or two ways of linking to the adjacent unit. this allows us to accommodate a growing tenant. CARPENTRY: more mechanical room and bathroom "tops".